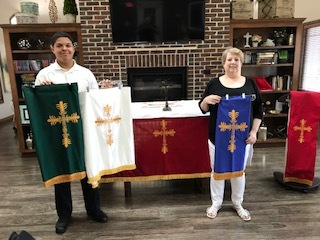 At its service on Pentecost Sunday, June 4, the congregation of St. Mary’s Anglican Mission in Chatham witnessed the blessing of four seasonal frontals made and embroidered by parishioner Debbie Brown (above right). Also pictured is fellow parishioner Nate Klughart. f you are ever in the Springfield area, please join us for services.